Dear Readers, today we set off on one of our favourite walks. We headed downhill into the valley to the right of the photo, known as the Rotmoos. 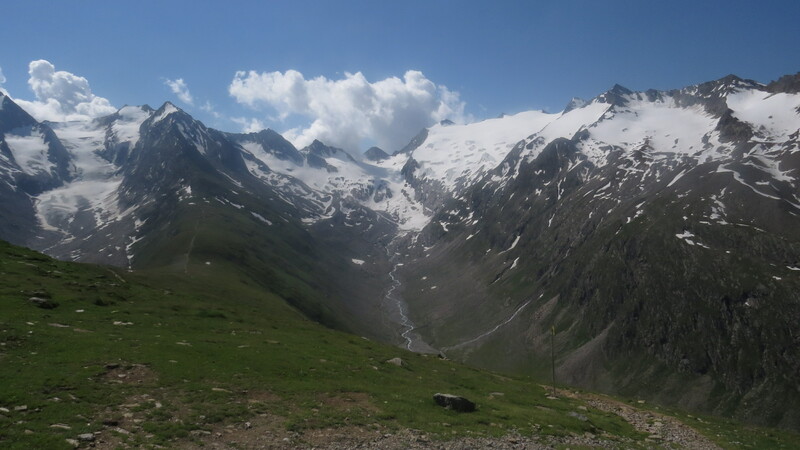 At the far end there is a gradually retreating glacier, and this leaves a large area of terminal moraine, rocky strata where only the toughest of plants and animals can survive. But at the entrance to the Rotmoos is a much kinder area, with bogs and a more varied flora. 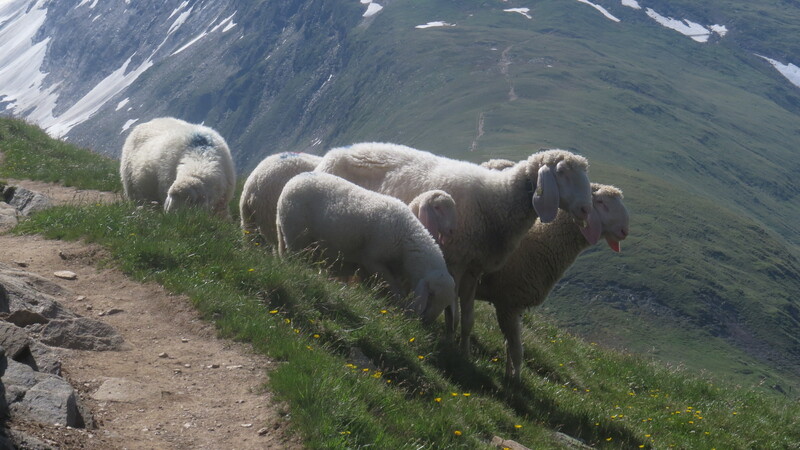 As we headed down, we met up with our first old friends- Long-eared sheep. 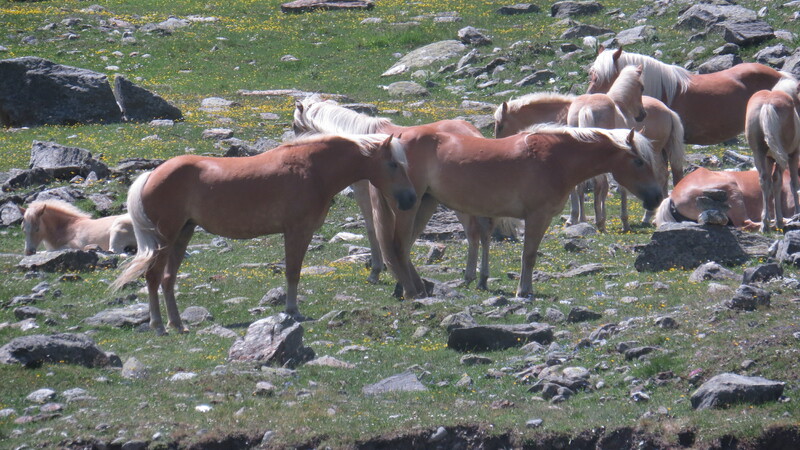 They graze up here and across all the mountain valleys until the end of September, when they are driven back home. ‘Home’ normally includes Italy, but for the first time in decades the Italians are unable to pasture their sheep here because there has been an outbreak of foot-and-mouth. I’m sure many of us remember how devastating this terrible disease was when it hit the UK, and my heart goes out to the Italian farmers who are coping with it. May it be quickly brought under control, for the sake of humans and animals. So, here we are at the entrance to the valley. I have never seen so many of what my biology used to call ‘yellow compositae’ – in other words, dandelions and hawkbits, nippleworts and Leopards-bane, Ragwort and Groundsel. But I am keeping an eye out for another old friend. 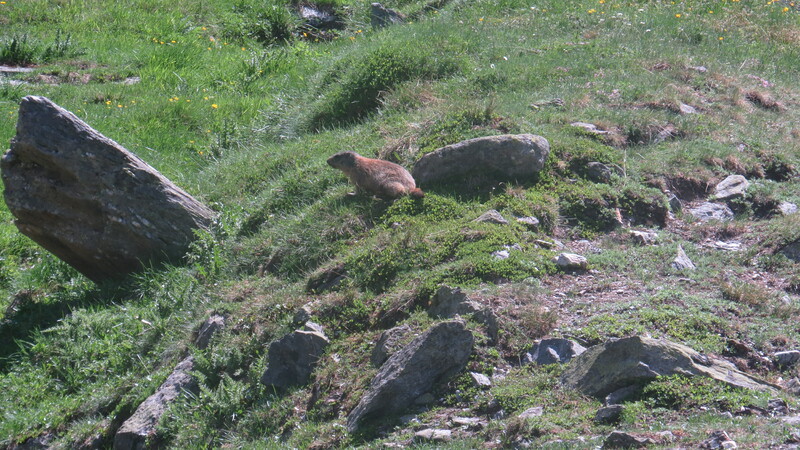 A holiday in Obergurgl is not complete without a marmot sighting, and, as we walked down, one galloped right across our path. But it wasn’t until we were eating our hotel-provided lunchpack that we got a proper look. For my North American animals, this is a rodent about the size and build of a groundhog. This one was looking particularly sleek and happy, and didn’t even bother to whistle when he saw us, which is most unusual – normally the slopes ring with the irritated cries of marmots.A marmot giving a proper warning whistle will stand on his back legs and then bow down as he does so, as if worshiping the mountain peaks opposite. The marmots’ main predator is the eagle, so they watch the skies with all the intensity of a meerkat on an anthill. But they also need to get on with eating before the winter comes and so some of them become indifferent to humans. 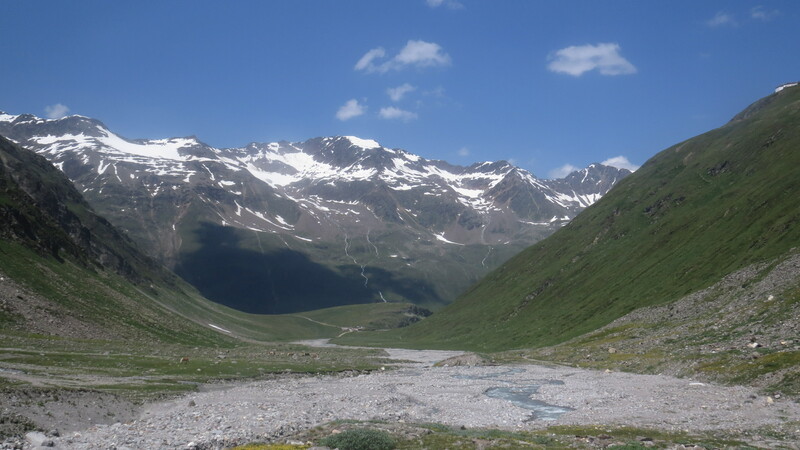 It is illegal to shoot animals in the Oetz National Park, which is where Obergurgl is located, but every hotel has a fine collection of stuffed animals and mounted deer skulls to show that this wasn’t always the case. Onwards! And here are yet more old friends. I consider these Haflinger horses to be some of the most beautiful in the world. As they stood on the opposite shore of the glacial river that tumbles through the valley, their manes and tails stirring in the breeze, they looked like creatures of legend, made of bronze and gold. They are ‘owned’ by the family Scheiber, who own pretty much everything in the Oetz valley, from the cement works to the biggest hotel to the car hire company, but for most of their lives these horses roam free, brought in only for the winter. 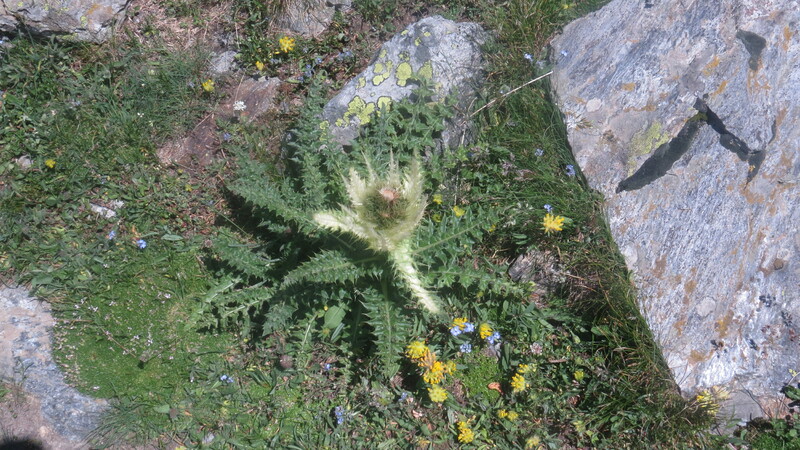 As we head up the valley towards the glacier, the plant life begins to change. I love that this plant is called the Spiniest Thistle, and wonder if there is also a Spinier and Spiny species to complete the set . The Spiniest Thistle certainly lives up to its name – every surface is covered in sharp protuberances. It is an unprepossessing plant, with its yellowish-white flower, and its attendant swarm of tiny flies, but it does point to an interesting fact. 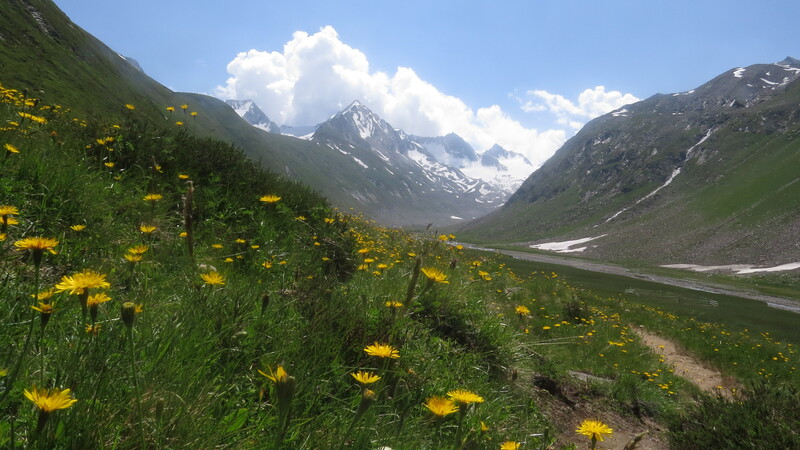 In the higher altitudes of the Alps, nearly all the plants are pollinated by flies, rather than by bees and butterflies. Lots of plants grow in cushions once we start to get into the moraine itself – the big danger here is desiccation, and being close together helps to preserve water. 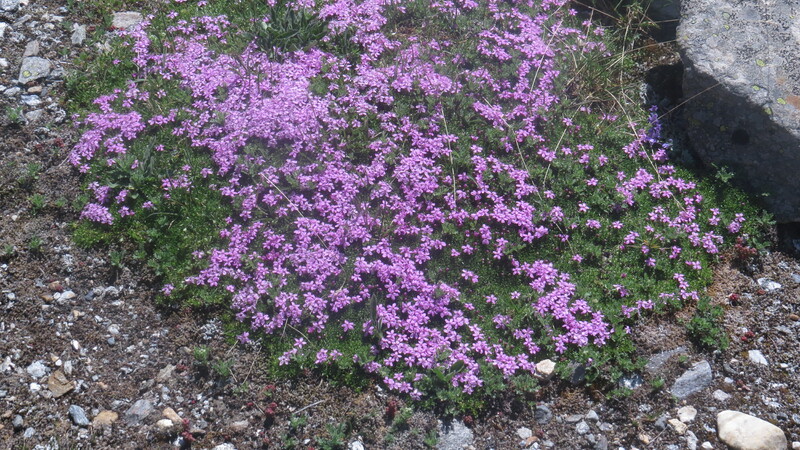 This Moss Campion was actually much pinker than it appears in the photo here – many of the flowers are intense in colour, almost as if reacting to the UV rays. And here is a real find. Remember Ivy-leaved Toadflax from the Wednesday Weed? Here is the Alpine version. 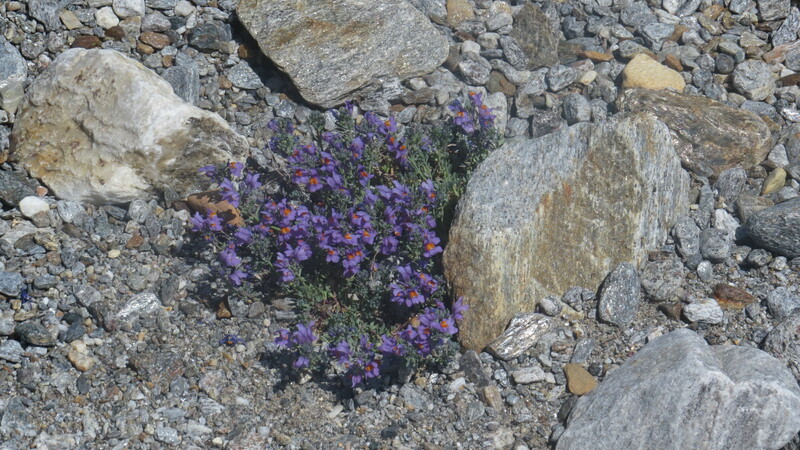 In shades of violet and orange, it’s a delight, hiding amongst all the grey rocks. The flower is exactly the same shape as that of its urban cousin. Reluctantly, we head for home. It’s important to pace yourself when you’re middle-aged and out of shape, and the walk back to the hotel has some horrible downhills on service roads before we can get our Almdudler (a herbal brew that we’ve become rather fond of over the years). But there is one last small treasure. 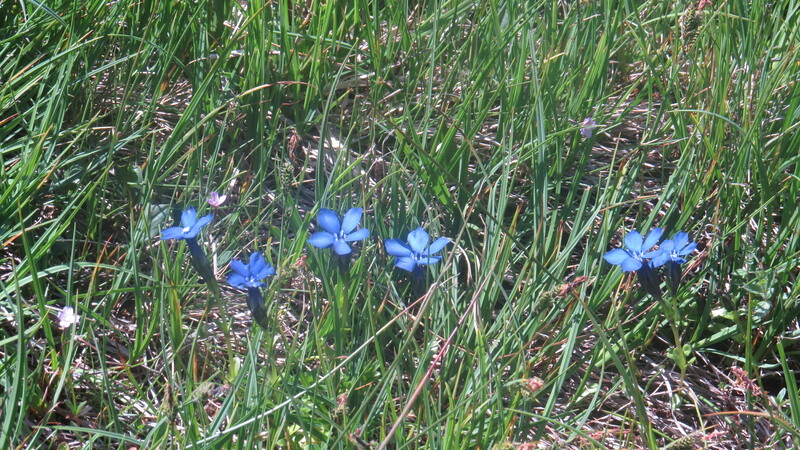 Just coming into flower at the edge of the bog are some Spring Gentians. They are the bluest things I have ever seen, so blue that they almost hurt to look at. No photo will ever do them justice. This entry was posted in Bugwoman on Location on July 7, 2015 by Bug Woman. Thank you for a great holiday post with super flora and fauna….a marmot now that would be good to see! What tiny toadflax and such a blue gentian too…marvellous!